No matter that I tried to prepare, it was still a shock to get off a plane in a country with a very different language and way of doing things. How do I even buy groceries? Well, yes an “elma” will look like an apple, but where do you get them? And, where do you get a dish drainer or a cell phone or a step ladder? Or ground black pepper? The packaging is all different. Stores seem to “specialize”. Do they have duct tape in Turkey? Light bulbs? Where do all these buses go? And when I do buy my apples and the clerk says “yermi beş”, what does that mean? So began my soon to be love affair with Istanbul. Eight thousand years or more of continuous human habitation, and I was its newest inhabitant…. In 2004, Istanbul embarked on a bold project to dig an earthquake-proof train tunnel below the Bosphorus. The project has unearthed many previous civilizations, some dating back 8,000 years. People were living in this spot before the great earthquakes which shook this peaceful, bountiful river valley and brought the salty waters of the Mediterranean flooding into these fresh water lakes and rivers. Clay burial vessels, intact wooden ships, and a multitude of other artifacts found connect Istanbul to its human inhabitants from those many years ago. Istanbul itself emits an aura of human connection woven intimately together over the eons. The beautiful turn of the century German Fountain sits in the Sultanahmet park which was the Roman Hippodrome, which sits atop earlier Greek ruins, which sits atop still earlier civilizations. You can feel the connection through the soles of your shoes as you walk the streets of this marinated city. 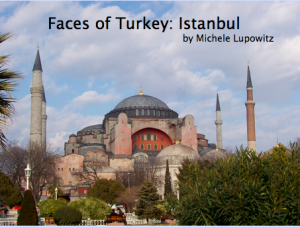 Come experience Istanbul; walk with me through the pages of this book.